In his oral evidence to the inquiry yesterday, editor of the Daily Telegraph Tony Gallagher was asked about the PCC’s ruling in 2011 that the newspaper was wrong to use subterfuge to record MP Vince Cable at a constituency meeting – although the depth of questioning of Gallagher was criticised by Roy Greenslade in his Guardian blog. The PCC ruling, which we accepted but were unhappy with … they required us to publish an abridged version of that ruling. I felt that it was a matter of such public interest that we should publish the entire ruling, which was, from memory, about a third longer than the abridged ruling. We published it in its entirety. When asked what the public interest was in publishing the entire ruling, he responded that “the story itself generated a huge controversy” and “was probably the most important PCC ruling of 2011”. I felt in the interests of justice, we should carry the entire ruling, given that we’d devoted a fair amount of space to the embarrassment of the Liberal Democrats in December 2010. This entry was posted in Journalism and tagged Court, leveson inquiry, telegraph, Tony Gallagher on January 11, 2012 by Rachel Bartlett. The Telegraph today published a series of documents including letters said to have been sent between former prime ministers Tony Blair and Gordon Brown, revealing what the newspaper called “the extraordinary rift at the heart of Labour”. In its report on the contents of the files, more than 30 memos reportedly belonging to Labour MP and former education secretary Ed Balls, the Telegraph accuses the MP of being involved in a “plot” to overthrow Blair, an allegation which he told the BBC today is “not true”. Look I’m not going to deny to you there weren’t tensions, there weren’t arguments. It was hard during that period … But the allegation there was a plot, that there was nastiness, brutality, is just not true. It’s not justified either by the documents themselves or by what was actually happening at the time. The Cabinet Office has since confirmed it is looking at whether the particular set of papers was in the possession of any government department, and only then would it look at whether a breach had occurred. Following this announcement the Guardian reports that education secretary Michael Gove said he was “confident his office will be cleared”. This entry was posted in Editors' pick, Newspapers and tagged Ed Balls, files, Gordon Brown, leak, memos, telegraph, Tony Blair on June 10, 2011 by Rachel Bartlett. The Telegraph reports that an order has been issued in the Court of Protection which specifically bars the publication of related information on Facebook and Twitter. This follows the posting of allegations on Twitter related to celebrities who were accused of having sought injunctions to protect their privacy. Legal experts said they had never seen an injunction which specifically barred publication of information on social networking websites. The order also bars reporters from going within 164 foot (50 metres) of the woman’s care home without permission. This entry was posted in Editors' pick, Legal and tagged court order, injunction, Legal, social media, telegraph on May 13, 2011 by Rachel Bartlett. 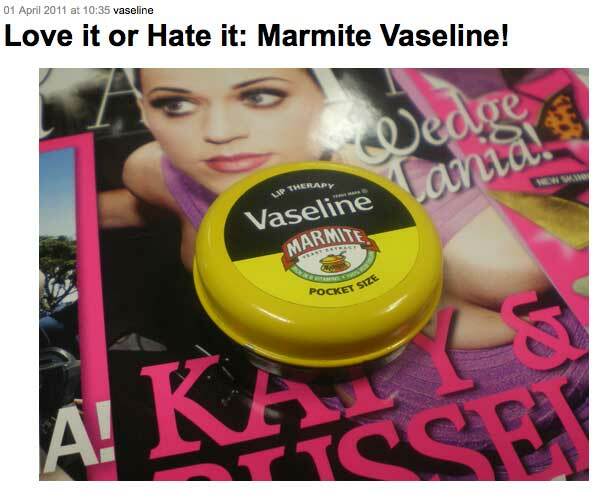 Midday has brought another April Fools’ Day to a close, and the UK media has gone to town as usual. We’ve taken a look at some of this year’s spurious stories. Jeremy Paxman is quitting University Challenge because of a move to multiple choice questions, if this article in the Radio Times is to be believed. Teams will be given three lifelines, to be used once only per match: “switch”, “clue” and “phone a Professor”. They will also be permitted to confer on starter questions. It is thought that this last change was what persuaded Paxman to tender his resignation. 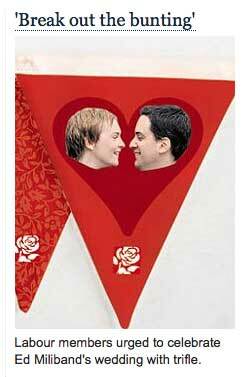 The Telegraph has gone for this Labour party memo urging members to celebrate the wedding of Ed Miliband and Justine Thornton with “street parties, trifles and bunting”. Now the musician and sound pioneer Robert Fripp and Simon Heyworth, a leading sound engineer who produced Tubular Bells, have been working with the BBC so that for the first time 3D sound should be available to Radio 4 listeners. The Independent reports that Portugal is to sell Ronaldo to raise €160 million to help alleviate its national debt. In a move which some observers claimed “will lead to the destruction of the World Cup”, Cristiano Ronaldo has agreed to “act like a patriot” and be sold to neighbouring Spain for €160m. According to this article on Pulse, patients will be staffing GP surgeries. The Sun – always good for an April Fool gag – has gorillas running around with iPads in “Planet of the Apps”. 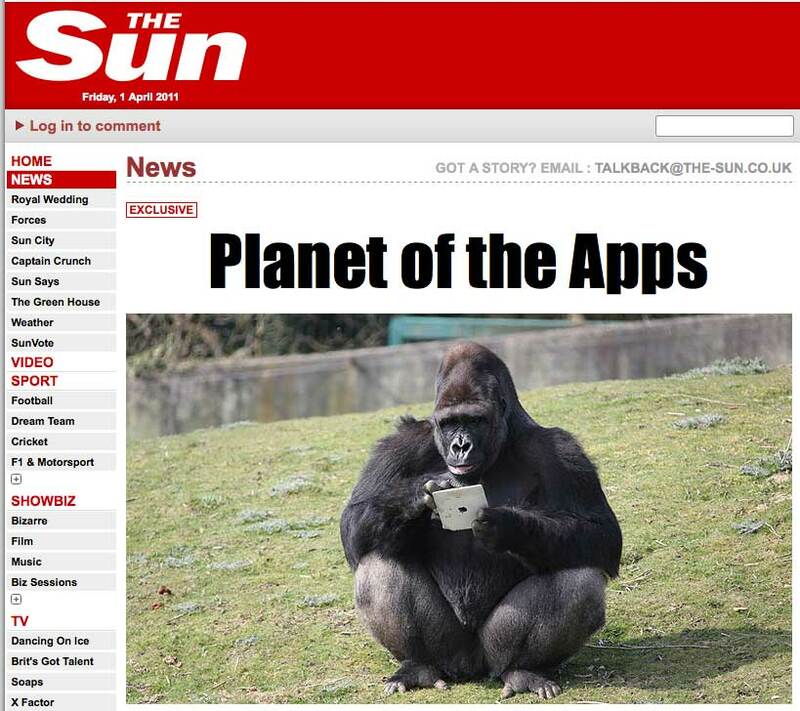 The article claims that gorillas at Port Lympne Wild Animal Park have been given iPads (though presumably not the iPad 2, unless the gorillas have had better luck than most getting their hands on the sell-out device). Fathers’ groups are taking legal action against Mumsnet on this mock BBC News site. “To clarify, this April Fools’ hoax story has nothing to do with the BBC”, a tweet from the official BBC News Twitter account said. A number of groups representing male parents, including Justice for Fathers, Men Can Be Mothers Too and Fathers Need Forums, have launched a class action, believed to be the biggest of its kind in protest against the site’s growing influence over politics and popular culture. 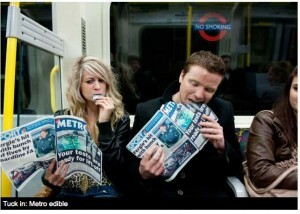 An edible edition was this morning’s page three hoax from UK freesheet Metro. The EU is to appoint a high-level truth teller, if this euobserver.com article is to be believed. Other tasks include throwing custard pies at prime ministers whose economies require an EU-IMF bailout and sounding a klaxon whenever anybody uses the phrases “shared values” or “human rights” in reference to EU foreign policy. Builders will no longer be tempted to wolf-whistle according to this blog entry on Builder Scrap. The “Stop That Hard Hat” comes with tiny speakers which play pre-recorded messages to the offending builder whenever they detect a wolf-whistle. The first whistling offence prompts a warning about site behaviour. And any further whistling leads to recorded readings from the works of famous feminist writers like Germaine Greer and Andrea Dworkin. The Bookseller reports that bookshops are to have a quota on foreign authors. 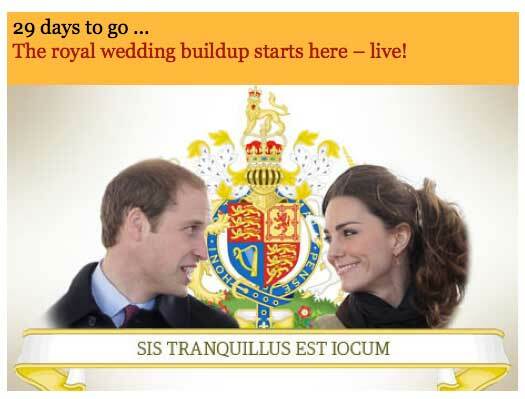 The Guardian – which went Twitter only in 1999 – has launched this live blog on the royal wedding. Prince William and Kate Middleton are due to be married at Westminster Abbey in four weeks time. In something of an about turn, the Guardian today pledges its “full throated support” for the monarchy [which is a contribution form Comment is Free]. Follow here for live coverage of all the latest royal wedding news, build up and reaction. And Will and Kate are going to Cleethorpes for their honeymoon, according to this article on This is Grimsby. The Grimsby Telegraph can exclusively reveal that The Pier will be hosting the party for the royal newlyweds, which will also be attended by the groom’s best-man, his brother Prince Harry. And from the so-called ‘Marmite couple’ to Grazia’s Marmite Vaseline. With thanks to everyone who sent April Fools’ pranks to @journalismnews. We’ve included suggestions from @BeckieOwens @stevenowottny @GMPrendergast @crimeticreader @Le_Chat. Keep the tweets coming as we’ll be doing another April Fools’ pranks round-up at the end of the day. This entry was posted in Editors' pick, Online Journalism and tagged april fools day, Grazia, Independent, sun, telegraph, The Guardian, The Puse, This is Grimsby on April 1, 2011 by Sarah Marshall.